I chose this recipe because I was looking for something tasty that my family would enjoy that had a "red" theme for Valentine's Day. My wife & I have 4 daughters that have grown up and their taste pallets have matured but they are not big red meat fans. Chicken fit the bill. I used whole chicken breasts instead of halves. After reading several other reviews, I noticed many concerns about the cranberries and general dryness of the dish so I used the canned whole cranberries which would increase the moisture content. also Besides just brushing the breasts with bbq sauce, I used honey BBQ sauce and increased the amount to 1 1/4 cups & poured the remaining sauce over the dish. the result was fabulous. 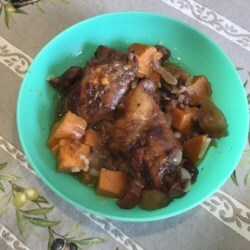 It not only increased the moisture content of the chicken, but it melded nicely with the onions , apples, carrots and sweet potatoes and made a delicious semi-thick sauce that could be spooned over the chicken at serving. Although I love onions, I will decrease the amount to one onion for a yield of six servings next time. Carrots were a bit much as well. I used 8 rather than the 9 that the recipe called for. I will decrease these to six. The sweet potatoes presented enough orange color and flavor for this dish. I needed 2 baking dishes to handle the large chicken breasts. (we love left overs) I served this with long grain and wild rice, a perfect compliment. All in all, this was a very tasty, well received meal and a keeper. I will make this again when we have guests over.